Tabletop games have seemingly covered every theme possible: spacecraft vying for dominance of the galaxy, farmers working to have the most plentiful harvests possible, colonizing Mars, rebuilding destroyed cities, running auto plants, you name it! Surprisingly, until I played Big Easy Busking, I hadn’t come across a game where the theme was street musicians vying for control of the crowd, the love of the city. Area control games are a particular love of mine, but I do grow weary of the various iterations of soldiers/creatures/ships that can seize power of designated locations after a while. Having played the alto sax most of my life, and having a deep love of jazz and street music in general, it is with great pleasure to play a game that marries the area-control mechanic with the concept of musicians competing against each other for various blocks of the city. 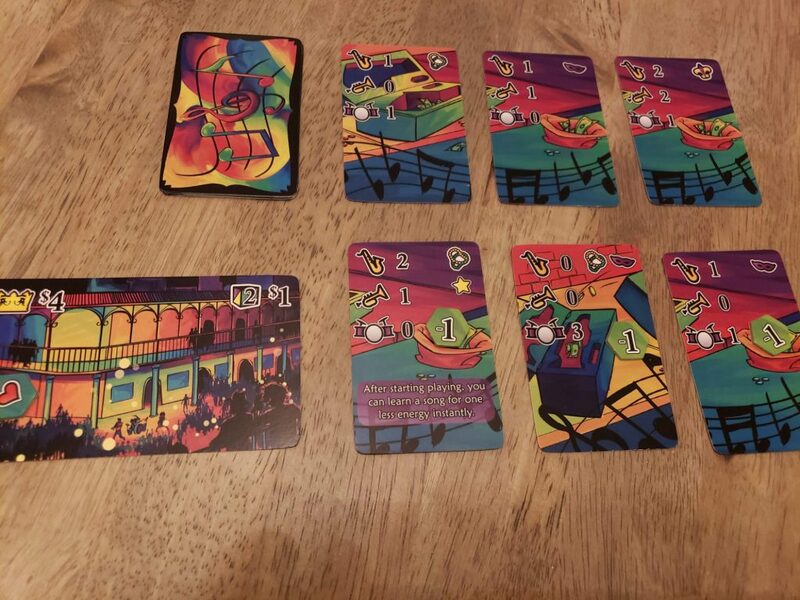 As I’ve noted, Big Easy Busking is an area-control game, and will involve 3 rounds where you must judiciously apply the resources available to you in order to achieve the maximum love from the crowd. Each player takes a band with an associated meeple color; your band is represented by your band card with 3 musicians: the sax player, the drummer, and the trumpeter. Every musician starts with 4 energy cubes each of your selected color (on each musician), and 3 extra energy cubes to the side (total of 12). The city itself is represent by 3 city block cards to start, an additional city block is added at the end of each round. There are chits that represent ‘moods’ for each block, randomly added at the beginning of the game on each city block. Moods are represented by tokens that are randomly selected at the start of each round. They can be a Heart, Bead, Mask, or Tambourines, and you match that mood with the mood of your Song, or one of the Standard songs available players. In addition to your band, you also receive 3 songs particular to your meeple color, which can be used throughout play. There are also 3 Standard songs available to all players, as well as a market of songs that can be purchased for future rounds. The setup takes just a few moments, and you can be deep into some amazing songs before you know it! Each round, you choose a song either from your hand, or from the Standards available to all players, and match it to one of the city blocks. Each song has a different energy requirement: some require more drums than sax, more trumpet and no drums, etc, so you must choose carefully when selecting which card to place and where. 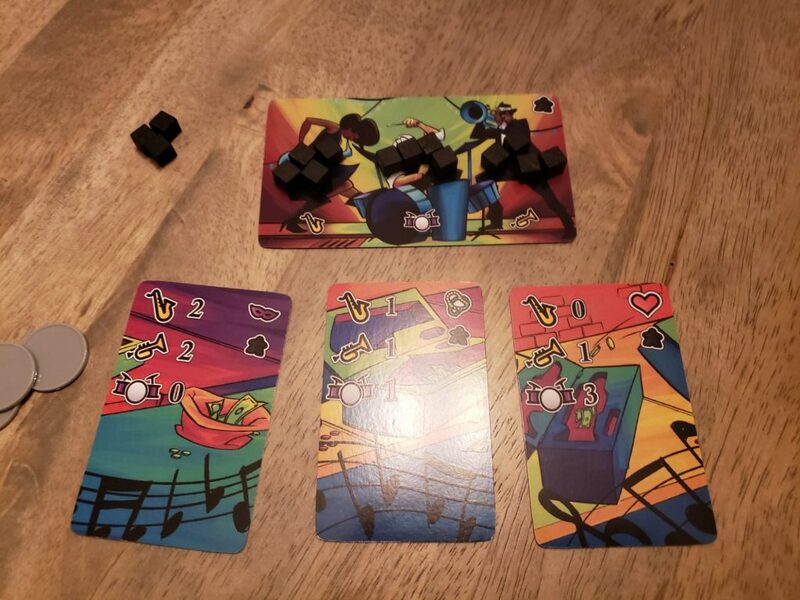 After each round, scoring occurs (whomever has the most energy/mood matching a crowd gets the bonus marked on the city block card), and it all starts again; energy cubes are put back on to the bands, song cards go back in the hand, and new cards can be played. With each round, another city block is introduced, adding another possible location to play songs. The game is bright and beautiful, and even though this isn’t the final version, the art is absolutely gorgeous. Each of the cards pop on the table, and it is pleasant to look at. 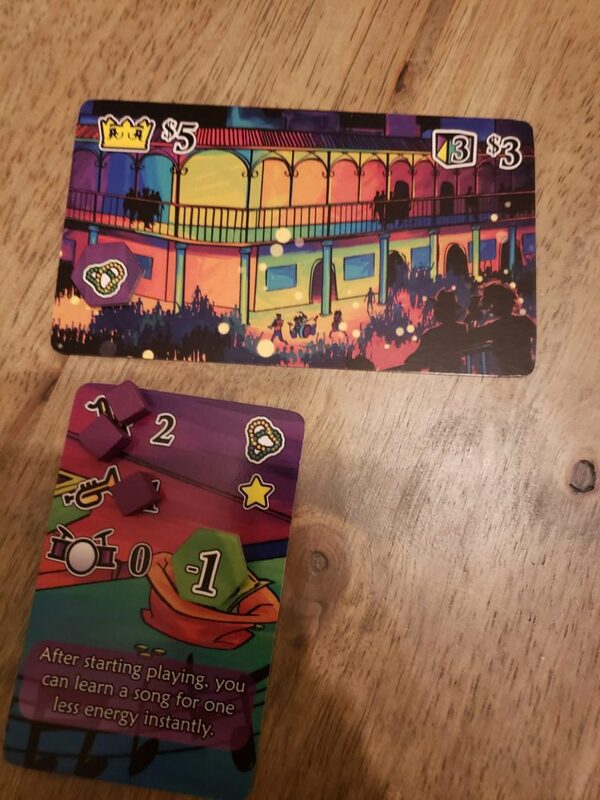 The version I had does not reflect the final game, as each card will have unique artwork for the bands, city blocks, and songs. Setup takes very little time, and the game is low complexity. But it does have a lot of strategic depth in the actions you take, the songs you play and where. This increases with the number of players, and definitely improves at 3 players and above. There was also a solo version included, and while there are two automata included, this didn’t have the same dynamic feel as play with live folks. But it is nice to have the option available. Some of the songs you can purchase in the market have actions available (decrease cost of energy, a bonus for a certain mood of song) so that does add some nice twists, but there are so few of them that they are few and far between. The number of songs available is limited, so an increase would definitely be something I would like to see. It speaks highly of the game that I REALLY want to see more songs, more locations, more bands. I wouldn’t dismiss Big Easy Busking as a light filler game. There is a lot of fun to be had that can rival some of the more obviously complex area-control games. I’m excited to see how folks respond to this, because it really hits a spot that most games have avoided up until now. It’s fun, it’s a good length (45 minutes was the average time) and, I’ll say again, it’s beautiful. But the easiest endorsement I can give it? Already backed it. Check it out! Next postDragonsgate College Review – Wizards and Warriors and Rogues, OH MY!